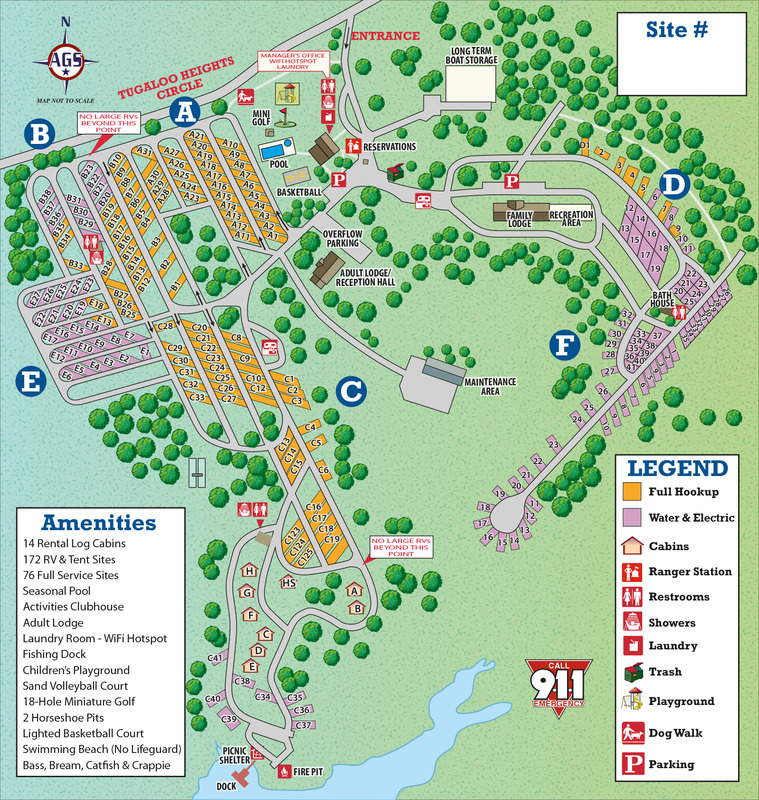 Ask fellow campers about "Thousand Trails / Carolina Landing" and nearby attractions. This could be a very nice place, if capital was invested in it. Most sites do not have sewers. As a Thousand Trails member, I joined so I did not have to "boon dock" it. If I wanted this I could easily stay at the numerous state and national camp grounds. The power was only 30 amp with no sewer hook up. The "honey wagon" does make a weekly visit but for those like us that full time and actually "live" in their rigs understand. The black and gray tanks fill quickly and I am sure the heck not trudging up a dirt road in the middle of the night to make a visit to the rest room. The full hook up section was jam packed and tiered in a stepping type of arrangement. The sites were very tight there and as we waited for a full hook up site, we remained in section F site 6. Laundry room was adequate with 4 washers and dryers. Family lodge was closed. The play ground is barely basic and not configured for small children. The staff were friendly as were the others in RVs. We planned on staying 21 days but shortened it to one week. I would use this as a rest area as it is close to I-85, but that is as far as i would go. Unless you are "camping" which we do not do then this campground might be suitable for you. Activities like shopping and anything else is at least 20 miles away. Call ahead and check availability for "full hook up". Otherwise, you are in the back and camping. We camped at Thousand Trails / Carolina Landing in a Travel Trailer. Site had big ditch in trailer path. Had to manipulate around. Very hilly, extremely tight turns. Site sea of mud; no gravel. Slippery due to rain. Had to put fridge on gas. Sewer hookup was full of someone else's sewage. Couldn't use it. Security lighting burned out. No emergency contact information available for help with full sewer. Horrible experience. We camped at Thousand Trails / Carolina Landing in a Travel Trailer. Staying 4 nites. Given a map, with two (50A) sites to check. Both were up a hill and tight. Picked the better. Was charged $3 a nite for 50A. Hear that this is becoming standard in parks. This time of year, should have asked for 30A. Many seasonal/permanent sites. Drove around camp, not many level sites. Our site, 4' slope on passenger side, no place for a chair. BBQ almost on road. Picnic table (none) would have been on 30 degree slope. Grass on slope needs to be cut!!. Questionable return. We camped at Thousand Trails / Carolina Landing in a Motorhome. Drove to Seneca. Walmart, (cheap gas), and every kind of food place. The only reasons I gave this park a "2" are that it was part of my Thousand Trails package and therefore didn't cost anything out-of-pocket and the people I met in the park were friendly. The roads are crumbling and falling apart; the sites are narrow; there are broken water spigots; the sites are not level. I was first sent to a site where "the staff had been cutting trees". There was a stump in the middle of the "pad" that was about 4 inches tall and probably 6 or 8 inches across (not visible until I pulled into the site). and the trees were encroaching on the "pad" to the point that, in trying to maneuver my tires past the stump, a branch ripped a hole in my roof. The bathrooms were right across from the site so the actual pull-through area was extremely narrow and I had to drive my truck up on the hill in order to get out of the site. I found another spot where the people were leaving early because they couldn't stand it any more. They opted to BACK down the road rather than grind their way up in the traffic direction and navigate the narrow roads. 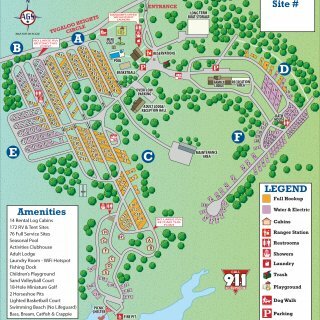 This is a very hilly campground so if you have any problems walking, be prepared! Friends came in after me with their tagalong trailer and were put in another section. They stopped at the top of the hill to scope out where their site was located and SLID down the hill all the way to the bottom on the loose gravel. I would never stay in this campground again. Oh, and the road coming in is so convoluted it seems you are about to enter the freeway on the off-ramp. We camped at Thousand Trails / Carolina Landing in a Fifth Wheel. Very difficult to maneuver throughout the park as it is on a hill. We tore off the sewer hose housing under our rig while pulling into one site, and also buried our front jack but luckily did not damage it. Most of good sites are taken by seasonals. We camped at Thousand Trails / Carolina Landing in a Fifth Wheel. Stayed here a week, first night was in a 30amp site, no 50amp sites were available, then moved to a 50amp site the next day. The manager knocked on the door and told me about the open 50amp site (A-17) and asked if I wanted to move to it. I thought it was great that she remembered I wanted 50amp and didn't have to chase it like I have at other TT parks. The site was fairly level, but I had no patio area due to it being on a slope. Same problem as with most TT parks, the good sites have been sold off, or are rented by full time residents. Enforcement of the 1 car per site rule would alleviate a lot of the driving problems. The pool was very clean, but was like bath water warm, not refreshing at all. We obeyed the rules and only brought in water to the pool, other's not so much. Cell service was excellent, park wifi only at the office. The park is tight to navigate with a big rig and it is hilly. There is lake swimming at the dock, but not really any good fishing spots from the bank. We camped at Thousand Trails / Carolina Landing in a Motorhome. The park is great to explore the area, Seneca is 15 miles away and has a cool area next to the old depot, Free Jazz/Blues concert on Thursday evenings during the summer. Anderson is just a short drive with anything you might want. Check out Ram Cat Alley in Seneca, SC. Brews on the Alley has 22 taps of craft beer, a full service coffee bar as well, Great service and vibe. They have local restaurants that will deliver to their location. Business' helping each other, Love it! Jazz on the Alley on Thursday evenings. They close down the street and set up tables for the various pubs and restaurants to serve you at. Your lawn chair is also welcome. Leave your cooler at home and support the local merchants! Beautiful Thousand Trails on the lake. Scenic views and nice swimming pool. Downside are the sites and roads. Very difficult to maneuver large MH w/toad. Tight turns and vehicles parked in the way. Hilly with asphalt full hookup 30/50 amp pull-though and back-in sites. NONE are level. We found 2 pull-thoughs that were long enough, 60 feet, but would have had to unhook toad to get level enough to put out slides. Just stayed the one night because it is close to Interstate, but hard to find and no turn arounds for large rigs if you miss it. Stay for the beauty in smaller RVs. We camped at Thousand Trails / Carolina Landing in a Motorhome. Park is tricky to find. Follow directions from park employee when they contact you. I found it in the dark, so they gave me good directions. Park is lovely. Staff is very efficient and helpful. They went above and beyond what was required as I was late in arriving and they escorted me to a site early morning. Landscaping is beautiful. Yes, it is hilly and motoring around requires skill, but the views are gorgeous. I will stay here again, even though park is "off the beaten path". We camped at Thousand Trails / Carolina Landing in a Motorhome. Rate based on monthly stay. For stays of 30 days or longer, a background check is required for which you pay $25. Wifi only available in the office/lounge area and not very strong. Great staff, friendly residents (most are long-term). Satellite friendly. All sites are very uneven, some rigs were parked w/ a wheel off the ground. Challenging to level our rig. Fairly quiet, no road noise. Would not stay again. We camped at Thousand Trails / Carolina Landing in a Fifth Wheel. Park is quite far from everything. Given the distance and lack of wifi, we ended up moving once our month was up. The park is kept clean, facilities were dated, but in good shape. The office called me the morning of my arrival date and confirmed reservation as well as provided great directions to the park. It is a hilly campground, we could get level, but it took some effort. Had good Verizon signal and was able to use satellite at our site (availability would vary as some sites had significantly more trees than others). We camped at Thousand Trails / Carolina Landing in a Fifth Wheel. Park staff was very helpful and even called us the day we were scheduled to arrive, gave directions which was very helpful. That said, this is a very tight park on a hill. Our pull thru was nearly 5" low at the rear and very tight getting our 41' DP in and out. As with many TT parks, there were lots of seasonals and few transient spots. We were just passing through and I would not consider this a destination park. We would only use it again in a pinch as it was so tight maneuvering around. No cable, did not use wifi. Verizon was 2-3 bars LTE. If you go here understanding what it it, it's fine for a night. Great staff, just not one of the best TT parks we've seen mostly due to small hilly sites and tight maneuvering. We camped at Thousand Trails / Carolina Landing in a Motorhome. This campground has really gone down. The sites are awful & the roads are even worse. They really offer nothing but swimming pool with screaming kids & putt putt that needs work. We camped at Thousand Trails / Carolina Landing in a Motorhome. Like others have said park is on a hill, but it is really not that hard to get level if you take your time. We stayed here for two weeks over the Memorial Day weekend and found the park very nice with good staff and management. Nice pool and plenty of activities to do in the park. Verizon cellular voice and data were both excellent. roads are narrow but you can make it work and if in the area again we will enjoy coming back to this park. We camped at Thousand Trails / Carolina Landing in a Fifth Wheel. All sites are on hill and none are level. We had to try 3 sites before we got close to leveling the motorhome. Wifi only in clubhouse. Narrow roads with many potholes, hard to maneuver 43 ft rv. Park is pretty. Staff is friendly and helpful. But roads and sites need maintenance. TT needs to modernize its parks with cable and upgraded wifi. Probably much nicer in summer when pool and lake are available. We camped at Thousand Trails / Carolina Landing in a Motorhome. We were concerned about the ability to get our 43' motorhome/bus into the campground and into a site. When we arrived, the staff member took us by golf cart to look at a couple of sites, and we found one that we thought we would be able to fit into. We were able to get parked reasonably easily. As mentioned in other reviews, the sites are on hills. One other motorhome owner indicated that they were previously on a site that was so sloping that they could not level. The weather is rainy so we haven't taken advantage of the facilities. Cost was free for 30 amp site with TT membership. We camped at Thousand Trails / Carolina Landing in a Motorhome. The park is great to explore the area, Seneca is 15 miles away and has a cool area next to the old depot, Free Jazz/Blues concert on Thursday evenings during the summer. Anderson is just a short drive with anything you might want. Check out Ram Cat Alley in Seneca, SC. Brews on the Alley has 22 taps of craft beer, a full service coffee bar as well, Great service and vibe. They have local restaurants that will deliver to their location. Business' helping each other, Love it! Jazz on the Alley on Thursday evenings. They close down the street and set up tables for the various pubs and restaurants to serve you at. Your lawn chair is also welcome. Leave your cooler at home and support the local merchants! Are you affiliated with Thousand Trails / Carolina Landing ?